URBANA, Ill. – Farming in western Kenya is challenging, to put it mildly. Although farmers can cycle two full crops in a single year, extremely poor soils and expensive traditional fertilizers, such as triple superphosphate (TSP), keep yields low. But results of a new University of Illinois study offer Kenyan farmers hope in the form of phosphate rock. “Phosphate rock matches or slightly outperforms triple superphosphate if you’re looking at traditional agronomic assessments of soil phosphorus. But if you look at the benefits in terms of soil biology and health, phosphate rock skyrockets ahead of TSP,” says Andrew Margenot, assistant professor in the Department of Crop Sciences at U of I and lead author on the study. Margenot and his team, which includes researchers from the University of California, Davis and the International Center for Tropical Agriculture (CIAT) in Nairobi, investigated the two phosphorus fertilizers in a long-term field trial on a typical Kenyan smallholder farm. Triple superphosphate, which is about 45 percent phosphorus, must be imported from Moroccan mines. 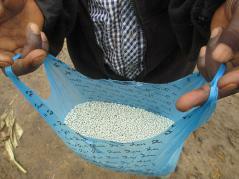 The fertilizer is highly soluble in the acidic, iron-rich soils typical of the region, but it presents several problems. Phosphate rock, a fertilizer with only 8 to 12 percent phosphorus, is not only inexpensive, it is naturally suited for use in acidic soils. “It’s the same mineral that our teeth and bones are made out of: calcium phosphate. For the same reason that acidic soda degrades your teeth, phosphate rock will dissolve best and be most useful as a fertilizer in low pH soils,” Margenot says. In the study, the researchers applied TSP, phosphate rock, or no additional fertilizer to fields planted in a corn-bean rotation for a total of 13 cropping seasons. At the conclusion of the study, the team collected soil and measured crop-available phosphorus and the amount that was bound to iron. Traditional measures of crop-available phosphorus were similar for TSP and phosphate rock, but about 33 percent more phosphorus was bound to iron, and thus unavailable to crops, in TSP-fertilized plots. Impressively, 299 percent more phosphorus was present in the microbial pool in soils fertilized with phosphate rock. Yield effects of the fertilizers were reported in a companion study, which indicated that phosphate rock matched and, in some cases, outperformed TSP. Margenot says that’s partially due to the greater availability of phosphorus, but it’s also due to the fact that phosphate rock lowers acidity and provides additional nutrients – magnesium and calcium – to the soil and, ultimately, crops. The article, “Biological P cycling is influenced by the form of P fertilizer in an Oxisol,” is published in Biology and Fertility of Soils. Margenot’s co-authors include Rolf Sommer and John Mukalama of CIAT and Sanjai Parikh of UC Davis.